The UK construction industry uses more than 400 million tonnes of material every year, making it the nation’s largest consumer of natural resources. The revised Waste Framework Directive requires that all EU member states recycle a minimum of 70 per cent of the waste generated from construction, demolition and excavations by the year 2020. The UK may be on course to meet this target but, according to an article in Construction News a couple of years ago, Peter Craven, head of marketing and sales at CDE Global, believes this will only be achieved by changing the attitude towards recycled material, rather than seeing recycling as a way of avoiding landfill costs or meeting sustainability targets. He argued that construction, demolition and excavation (CD&E) waste recycling needs to be seen in terms of the opportunity it represents and the products it can produce. Metso is another major player in the aggregate recycling sector. In an article in Aggregates Business Europe & International, Juha Tiilikka, the company’s global sales support, aggregates business line, says he has seen strong growth in aggregate recycling. Whereas previously 15% of aggregate material was recycled on any given building construction or highways project, Tiilikka says it’s now closer to 30%. When it comes to domestic waste, a 2016 UK waste statistics report* from DEFRA stated 2014 figures totalled 26.8 million tonnes of ‘Waste from Households’, a 3.3% increase compared to 2013. With these figures in mind, we looked at how, on a smaller level, domestic recycled waste has been used in construction projects across the world. Creating homes out of a redundant Boeing 727, converted railway carriages, shipping containers, old boiler rooms and dustbin shelters may just be a tiny pebble thrown into the massive waste recycling sea that currently drowns the construction industry, but it’s a pebble that’s created some innovative ripples. 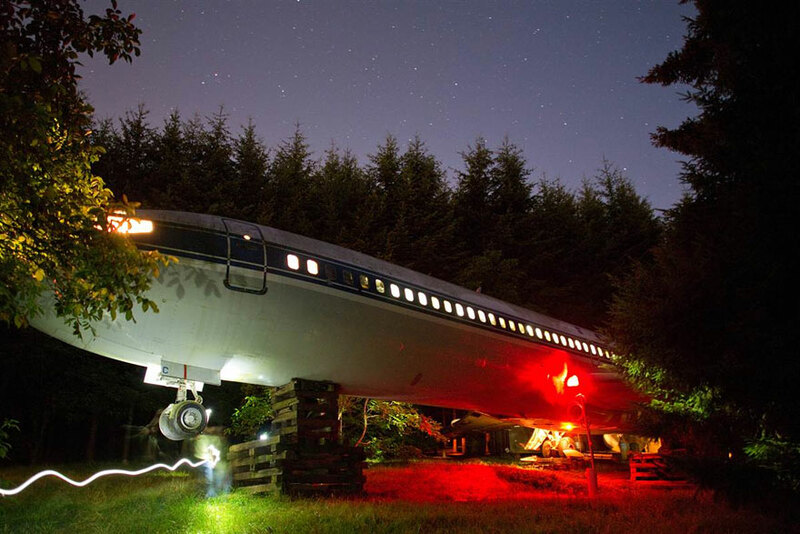 A recent article in The Telegraph looks at the inspirational story of Bruce Campbell in Portland, Oregon who’s made himself a woodland home out of a Boeing 727 that would otherwise have become scrap metal. Image Credit: John Brecher Aircraft parts too have been used to build a two-bedroomed guesthouse at La Cholla Airpark in Arizona, where 91 homes sit around a private airstrip. The guesthouse belongs to retired engineer, Toshikazu Tsukii who used the nose cone of a 727, two 707 fuselages and the tail end of a 727. Back home in the UK, around 25 Victorian railway carriages have been converted into homes at Dungeness in Kent and at Container City at Trinity Buoy Wharf, in the East End of London, there is a small community living in converted shipping containers. According to Homebuilding & Renovating, the entire cost of building the exterior of a home, including chimneys, external doors and windows, represents only 50% of the total costs with the balance going on internal trades, fixtures and finishes. Architect Piers Taylor who presents the BBC Two television series The House that £100k Built, believes there are substantial savings to be made if you know where to look. In the book, Building with Waste, Dirk E. Hebel, Marta H. Wisniewska and Felix Heise looked into the worlds of architecture, construction, and the delightfully named field of "garbology" to find new and exciting materials made out of waste you'd normally find at a landfill site. Some of their waste filled building materials include: newspaper wood made from paper and cardboard, then sealed so it’s waterproof and flame-retardant, roof tiles made from nappies and sanitary products, bricks made from old plastic bags and bottles and floor tiles made from recycled wine corks. 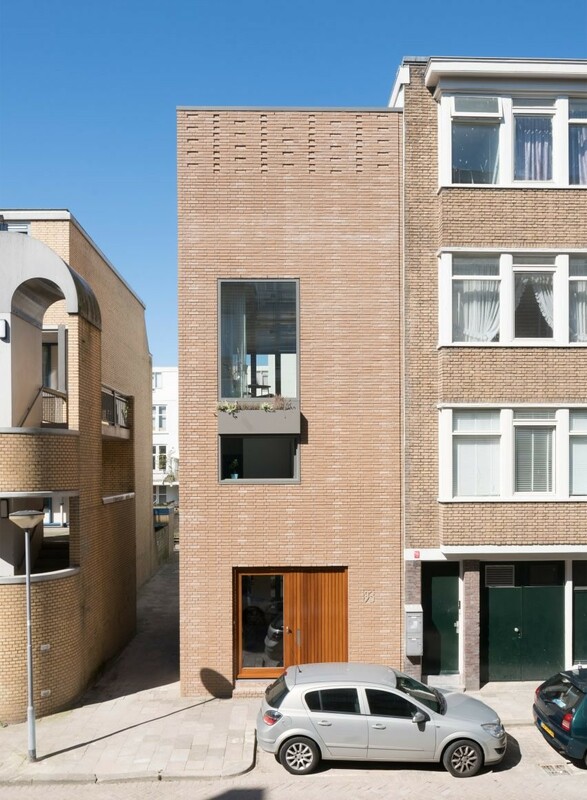 In Indonesia, two thousand ice cream tubs were used by architecture firm Shau to form the walls of a small community library in Bandung, and the bricks forming the facade of this house in Rotterdam (below) were made from 15 tonnes of compacted industrial waste. It’s not just the materials we use that’s creating innovative solutions to cheaper housing, Wandsworth Council's housing department is at the forefront in creating new homes through its pioneering hidden homes initiative by transforming disused and problematic space such as disused car parks, old boiler rooms and dustbin shelters into good quality, affordable housing for rent and shared ownership. Recycling waste is without doubt one of the biggest challenges faced by the construction industry, yet as with most problems, finding a solution has created a hot bed of innovative, creative solutions and sparked a wave of new and exciting developments within the construction industry.